The Face Center is proud to offer the Obagi system, as well as Clarasonic Skin Care Systems. The Obagi-C Rx System combines the benefits of Vitamin C with a proven lightening agent to deliver brighter, more luminous skin. It’s been reported to give a more radiant and even complexion. The Obagi Nu-Derm system is proven to correct skin functions so that skin looks and acts younger and healthier. If you are concerned about: fine lines and wrinkles, sun and age spots, uneven skin tone, loss of elasticity or loss of natural skin hydration. This system corrects unwanted signs of aging caused by external factors and the natural breakdown in skin function as we age. Delivers immediate benefits with continued improvement. The ELASTIderm Décolletage System is a unique solution for the aging décolletage. It has been specifically designed to give patients the tools they need to rejuvenate the natural extension of their overall look with a chest and neck treatment with a skin lightening complex and wrinkle reducing lotion. A one of a kind topical eye treatment clinically proven to help restore elasticity to periorbital skin and reduce visible lines and wrinkles. The body stops producing elastin around the age of 21. Fine lines and wrinkles are the result of sun exposure and the normal aging process, which contribute to the loss of elastin. Elastin is a coil-like protein that provides the skin with its resiliency. Healthy elastin enables the skin to SNAP back into place. Damaged elastin lacks elasticity. Collagen is the major protein that makes up the connective tissue within the skin. Healthy collagen provides supportive strength for elastin. Damaged collagen lacks the structure to be supportive. Elastin and collagen are proteins that work together to provide skin with supportive strength and resiliency. You can see how collagen provides the scaffolding upon which elastin can thrive. When damaged, these degraded proteins cannot support or provide lasting elasticity in the skin. ELASTIderm uses a proprietary bi-mineral complex (Copper Zinc Malonate) that is clinically proven to help: restore elasticity and build collagen production. Removes dirt and excess oil , leaving skin clean and refreshed. Unclogs pores and clears dead skin cells while preparing skin to deeply absorb a liquified serum that targets acne at its source. Non-comedogenic, glycerin-rich moisturizer. 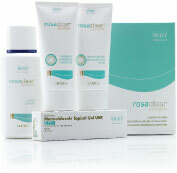 Clams, soothes and protects skin to enhance patient comfort.